Why is Pure Pitz so small? Pure Pitz is super-concentrated! A few gentle swipes under each arm pit is all you need - a small amount goes a long way and lasts all day! And the convenient size is travel and gym bag friendly. For shaved armpits, four to five months; some people even tell us six months! For unshaven armpits, one to two months. With armpit hair, apply and then blend in with fingertips. Where is Pure Pitz made? Pure Pitz is proudly, and purely, made in the USA in a certified organic lab. Pure Pitz is certified organic by DPI Clemson University, and preserved naturally without the use of any synthetics or food grade preservatives, and it comes in BPA-free packaging. These special details cost a little more, but we believe it is more than worth it! So, what exactly is in Pure Pitz? 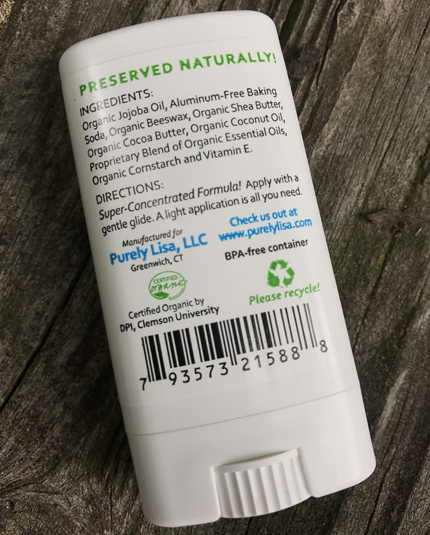 Pure Pitz uses only the purest of certified organic and natural ingredients: Aluminum-Free Baking Soda, Organic Beeswax, Organic Cocoa Butter, Organic Coconut Oil, Organic Cornstarch, Organic Jojoba Oil, Organic Shea Butter, a Proprietary Blend of Organic Essential Oils, and Vitamin E.
Will it stop me from perspiring? No, thankfully! Perspiring helps maintain body temperature by cooling us down. However, when you do sweat, Pure Pitz will completely neutralize the worst of body odor. We have several people tell us that they can do a full-on workout and have no odor! Where can I buy Pure Pitz?